Due to our recent family vacation I'm a little late with Mathilde's latest update. But don't worry, I haven't forgotten. For much of month number eight there wasn't a huge amount to report. Mathilde was growing and learning new things but nothing all that major. More just honing skills she'd already learned. And then about a week before she turned eight months old she pulled herself to standing against me (nothing new) and let go. And guess what? She didn't fall down! She just stood there, sturdy on her own two tiny feet. Since then Mathilde has been doing a lot of standing. Standing and clapping. The clapping is new too. I guess we applauded her standing so many times that she picked up on it. And now she applauds herself with a little clap too! I love how proud of herself she looks when she stands. Like she knows it's a big achievement. Mathilde refused to stand for me during her eight month photo shoot (I take the photos on my bed so it's a little squishy for standing) but you can see her here on Instagram. Are you following Little Hiccups on Instagram? If not, make sure to follow me to keep up with what we're doing when I'm too busy to blog. As I mentioned before, the last month has mostly seen Mathilde improving her existing skills. She's getting faster at crawling, she babbles more, she pulls herself up and walks along furniture with more confidence, she's more interested in playing with toys (she loves baby dolls), she follows her big sisters everywhere... She does not like sitting still for very long - which makes these photo shoots increasingly harder and harder! Most of my photos turned out like the one below: Mathilde's arms in the air as she prepares to leap forward and grab the camera or escape off the side of the bed! We've continued with Mathilde's swimming classes and she still loves them. She just can not get enough of being in the water. Swim class and bath time are two of her favourite things. She just loves to splash! Mathilde's hair is getting longer (long enough for her to pull herself!) and it's starting to look lighter. In certain light it almost looks red but I'd say that given her brown eyes she is probably not going to end up a redhead. I imagine her hair will most likely be light brown or a dark blonde like Ava's. I guess we'll have to wait and see. It certainly is much darker than Ava's or Lola's at the same age though. Mathilde has grown quite a bit since her last check up at six months. 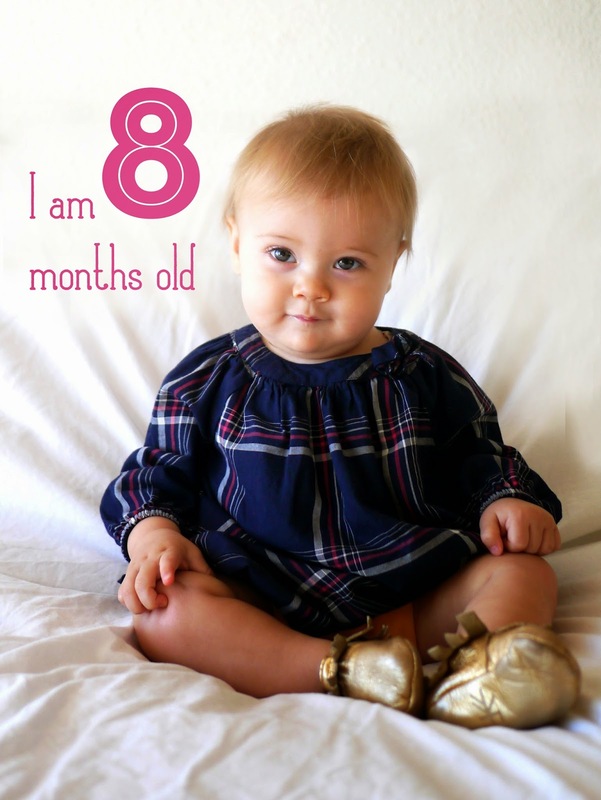 As of her eight month check up she now weighs 7.75kg (17lb1oz) and is 71.2cm (28") long. She's still slightly below average for weight but right at the top of the chart for height/length. All of that growing is pretty tiring for a little person. So are photo shoots. I'll leave you with this shot of Mathilde looking absolutely zonked at the end of her photo shoot. Maybe if she sat still long enough for me to snap a shot earlier she wouldn't be so tired at the end! See you next month. Maybe by then we'll have a walker. Eek!